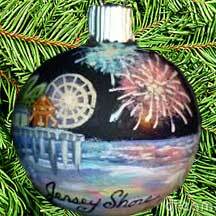 “Jersey Shore” is painted on a 3? glass ball featuring clouds, the Atlantic ocean, and sand dunes. This is the view seen every day by Jersey Shore native, artist Sandra Sutherland. 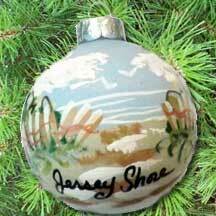 Her ornaments can be found in boutiques and gift shops from Asbury Park to Cape May. 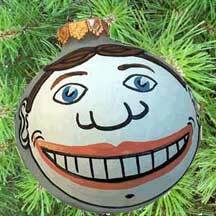 All ornaments are packaged in individual kraft boxes for gift giving.